ÜThe DCM300E Earth Leakage Clamp designed primarily to check earth leakage currents with a dedicated 30 mA range providing resolution down to 10 µA. The capabilities of the DCM300E extend to measuring currents of up to 300 A ac, making it a highly versatile instrument capable of taking current measurements in a wide variety of situations and applications. A typical application for the DCM300E would be the measurement of earth leakage current in a circuit where the GFCI repeatedly trips out. The measured result will quickly identify whether an excessive leakage current is causing the GFCI to trip, or if the GFCI itself is faulty. 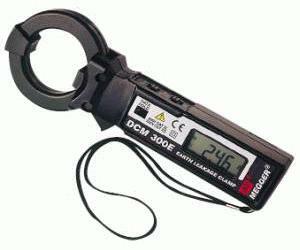 The DCM300E has 4 ranges: 30 mA, 300 mA, 30 A and 300 A with a best resolution of 0.01 mA. The analog-style bargraph of the DCM300E is very useful when monitoring changes, allowing the operator to easily interpret the rapidly changing bargraph rather than the digital display. Other key functions include the "Data Hold" feature which aids in measurements where there is a problem with accessibility or poor lighting, and the automatic power off feature that extends the battery life. This clampmeter was also designed with safety in mind and exceeds the latest safety design standards IEC1010-2-32 and EMC requirements. Extra safety features have been designed into the DCM300E to provide a safer working environment for the user.